Katalyst Data Management is a specialist in data recovery from damaged or deteriorated media, including stiction reversal treatment magnetic tape media. 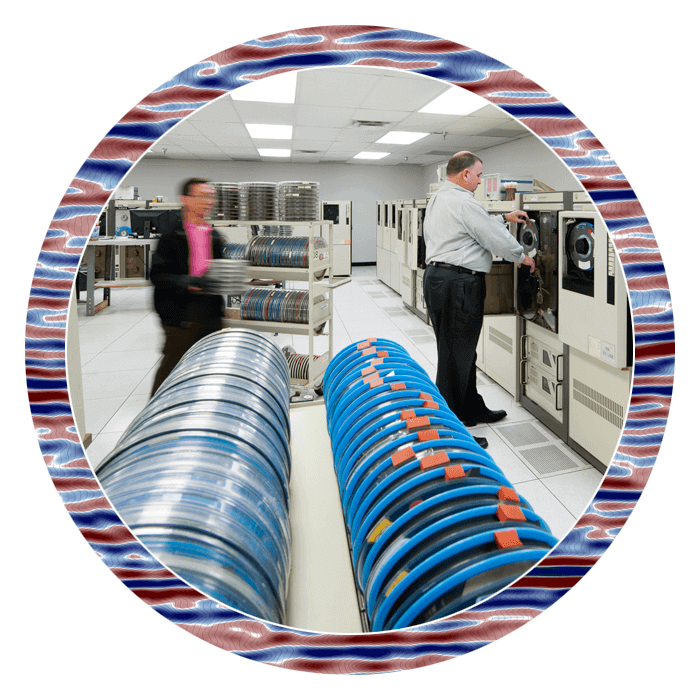 Our particular area of expertise is in the deterioration of older magnetic media suffering from edge damage, stiction, and a variety of other media degradations which occur due to age, poor storage or handling. Of all industries, it is the oil and gas sector that has been confronted by the effects of deterioration in magnetic media, more than any other. This confrontation started in the mid-1970s when it was found that a critical tape/head condition could occur in which the tape moving through a tape transport would physically stick to the tape head. The term applied to this condition was “stiction” (sticky friction). Our expertise is in the deterioration of older magnetic media suffering from edge damage, stiction and a variety of other media degradation. Stiction, as the term is used today, refers to a condition which produces similarly disastrous results but is caused by quite a different physical condition – namely the degradation of the binder layer of the tape itself. Stiction is also used with regards to hard disk crashes where the heads can stick to the platters. The binder of a tape is effectively the ‘glue’ that holds the magnetic recording material to the substrate of the tape. All binders absorb moisture over time, but some appear to do so more rapidly and in greater quantities than others. As this absorption occurs, chemical changes take place which tend to soften the binder. Expansion also occurs and this aggravates the problem by increasing the internal pressure within a reel of tape. As pressures build up, the softened components within the binder act as an adhesive which has the tendency to ‘glue’ consecutive layers of the tape together (similar to the way in which a roll of adhesive tape is observed). 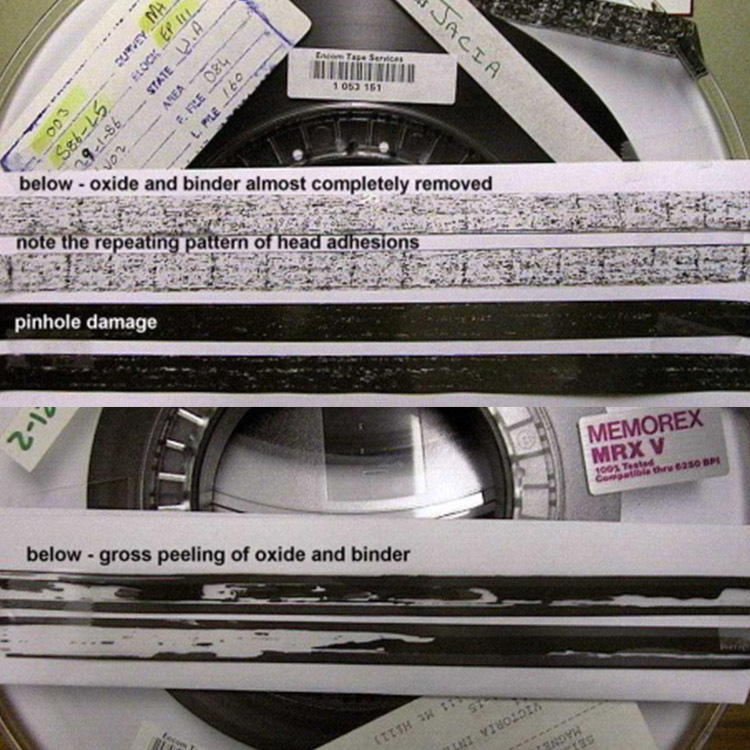 Peeling as tape is removed from the reel where portions of the binder oxide layer are removed from one layer of tape and redeposited on the next. Gouging of the softened binder either by the tape head, cleaning blades and/or other transport components. Destruction of the tape caused by jamming. Head adhesions (the binder melts and adheres the tape to the tape head). Increase in audible noise (often a highly objectionable grinding sound or high pitched squeal). ‘Peeling’ of tape from input reel instead of smooth release. Erratic movement through tape path. Head adhesion when tape is stopped in contact with tape-head. When a stiction affected tape is read on a high speed drive or cleaned or exercised, damage to the tape will almost invariably ensue – in many cases this damage will be gross with large sections of tape being destroyed forever. Stiction can, in many cases, be reversed to a sufficient degree, allowing data to be recovered from previously unreadable tapes. This stiction reversal method involves heating tapes over a period of 24 or more hours at specific temperatures (depending on the brand of tape involved). This process hardens the binder and will provide a window of opportunity during which data recovery can be performed. The process is by no means a permanent cure nor is it effective on all brands of tape. Certain brands of tape (eg. Memorex Green- see picture below) respond very well to this treatment. Others such as Mira 1000 appear to be largely unaffected by it. For more information on our stiction reversal treatment services, please contact us.